The 27th Division | August 30, 1917, New York City. Library of Congress. April 6, 2017 marks the 100th anniversary of our country’s entry into World War One, a war that engulfed most of Europe since 1914. United States troops tipped the balance toward Allied victory, forever transforming America’s role in the world - but this victory came at a great cost. WWI claimed over 17 million lives total – more than 116,000 United States troops were killed, 20 million wounded. No state would sacrifice more than New York. Over 500,000 New Yorkers served, and of those, 13,956 lost their lives. Once called “the War to End All Wars,” World War I was one of the bloodiest conflicts in human history and marked the dawn of devastating modernized weaponry such as poison gas, aerial bombing, machine guns and long-range artillery. Among the New York regiments were the 69th Infantry Regiment, known as the “Fighting 69th,” and the 369th Infantry Regiment, the first African-American regiment to serve in combat in the war. Twenty-five New Yorkers received the nation’s highest honor, the Medal of Honor, for their valor. The history of New York State and our country is a living history. Help commemorate the centennial of the United States’ entry into World War I by sharing your relatives’ stories, sending in photographs of the World War I monuments and plaques in your community, and submitting events happening in your community. 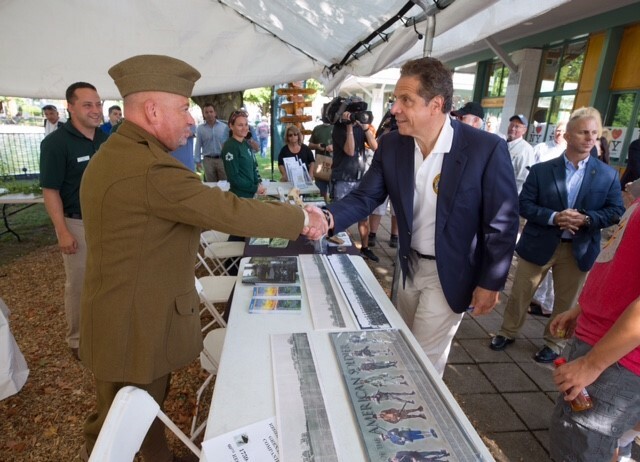 At the Great New York State Fair, Governor Cuomo greets Fort Ontario State Historic Site aide Peter Sterbak, dressed as a soldier in the U.S. Army Medical Corps during WWI at the State Park’s “Hats of History” exhibit. Exhibit: "A Spirit of Sacrifice: NYS in the First World War"
Join Senior Historian and Curator Aaron Noble for a tour of the New York State Museum’s WWI Centennial exhibition. New York State Museum, Albany, N.Y. This exhibit showcases dozens of federal government patriotic and motivational posters. A conference and WWI exhibit hosted by Fort Ontario State Historic Site. The arrival of the New Rochelle contingent at Camp Upton, Yaphank. Library of Congress. You--Buy a Liberty bond lest I perish. Library of Congress. Soldier volunteers during World War I, New York City. Library of Congress. Poster of war effort listing hundreds of recent American volunteers and the addresses of recruiting stations in Frank Leslie’s Weekly, circa 1917. Library of Congress. New York Mayor John Purroy Mitchel boarding the U.S.S. Recruit, a fake battleship built in Union Square, New York City, by the Navy to recruit seamen and sell Liberty Bonds during World War I, May 30, 1917. Library of Congress. American soldiers on a boat, leaving Fort Slocum, a military post on Davids' Island, New Rochelle, New York, 1917. Fort Slocum served as a major recruiting station during World War I. Library of Congress. Air Services School cadets training on radio equipment at Columbia University, c. 1917. Columbia University Rare Book & Manuscript Library. Arthur J. Putnam (left), a Cornell University instructor from Deposit, N.Y., volunteered as an ambulance driver with the American Field Service in Paris, 1917. Archives of the American Field Service and AFS Intercultural Programs. Soldiers of the 369th Infantry Regiment stand at attention with French rifles and helmets, 1918. National Archives. Red Cross recreation unit at Base Hospital #5 at Fort Ontario, Oswego, N.Y., circa 1918. Fort Ontario State Historic Site. A class on engines at the aviation training school at Mineola Air Station, Long Island, N.Y., 1918. Library of Congress. Rally for the Fourth Liberty Loan Campaign, Federal Hall, New York City in 1918 during World War I. The Four Minute Men was a public speaking organization of the Committee on Public Information. Library of Congress. U.S. Army School of Military Aeronautics at Cornell University. Division of Rare and Manuscript Collections, Cornell University Library. Newspaper clipping sent home by Basil Beebe Elmer, banker and World War I soldier, born in Ithaca, who served in the Company A, Intelligence Section of the United States Army 165th Infantry Regiment. New York State Library. 27th Division men, veterans of the Hindenburg Line & St.-Souplet engagements, lined up to receive comfort provisions at the Red Cross Depot, “Pictorial Record of the 27th Division,” Harper & Brothers, Publishers: New York: 1919. Courtesy of Stuart Lehman. The 27th Division learns of the signing of the Armistice, “Pictorial Record of the 27th Division,” Harper & Brothers, Publishers: New York: 1919. Courtesy of Stuart Lehman. Nurses of Base Hospital No. 2 in a parade for Anna Maxwell, founder of the Columbia School of Nursing. Archives & Special Collections, Columbia University Health Sciences Library. View a list of New Yorkers who died while in service during World War I. View a list of New Yorkers who were awarded the Medal of Honor for their service in World War I. The New York National Guard engaged in severe fighting in the Somme offensive, pushing the enemy into retreat. Called “The Rainbow Division,” the 42nd was composed of troops from 26 states and the District of Columbia. The 77th Division comprised draftees, who were mostly from New York City. The Division trained at Camp Upton in Yaphank, on Long Island. 369th: Called “the Harlem Hell Fighters,” the 369th regiment, fought with the French army in several major offensives. Watch brave soliders talk about their experiences during WWI. Receive free access thanks to the NYS Archives to Ancestry.com for WWI military service records for NYers who were enlisted or drafted in NY. On the centennial anniversary of America’s entry into World War I, New York’s commemoration activities will convey the pivotal role New Yorkers played in the War and help us preserve the names and stories of those who served. This war changed us as a nation, and no state dedicated more to the Allied victory than did New York. New York National Guardsmen like Sgt. Henry Johnson, and Lt. Col. William "Wild Bill" Donovan - who won medals for heroism-- set an example of heroism and self-sacrifice during the war, inspiring American Soldiers today. The legacy of World War 1 remains with us today and it's fitting that we mark this centennial for our Soldiers, our Airmen our nation and our state. New York and New Yorkers played a critical role in fighting what everyone hoped would be the “War to end all Wars,” from providing soldiers and supplies, to building planes and training pilots, and providing care to the injured. There are no surviving members of the military from WWI, but we can recognize and honor their service on this centennial, and commemorate the tradition of service above self that has been passed down through generations of New Yorkers to the present day. New York played a pivotal role in America’s defense of the ideals of freedom and democracy. The New Yorkers who served during World War I faced a conflict that the world had never previously seen. They faced this challenge with courage and grace, for their service and actions we are eternally grateful.